On Saturday 14th October we were treated to a fascinating introduction to using herbs to help our dogs (and a little about cats and horses, as a bonus!!). 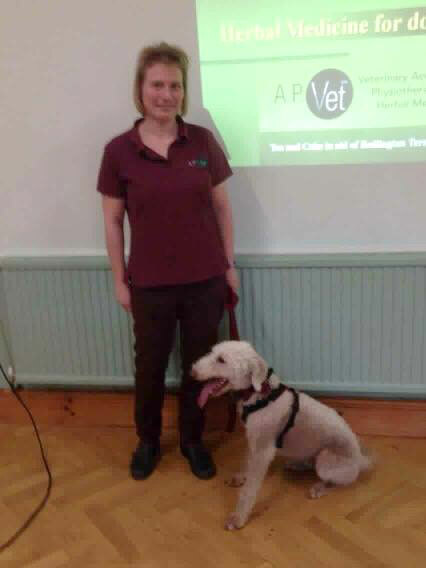 Iris Ege is an holistic vet practising in our area, who I met when we both locumed for a local veterinary practice. As people who know me will be aware, I prefer to avoid pharmaceuticals as far as possible in the care of my dogs and horses, and Iris has helped me a great deal with my aging dogs. I thoroughly recommend consulting her, especially if there is anything “odd” going on and you and your first opinion vet are struggling to get to the bottom of it. Iris introduced us to herbs that we can gather and prepare ourselves, and also some commercially available products. She explained where it is appropriate and beneficial to use them – and, very importantly, when we should NOT use certain herbs. There are many ways to prepare herbs, and Iris explained the advantages and disadvantages of the various methods. She also talked us through a number of case studies, and explained that in these cases, because of the problems the dogs had, veterinary supervision was necessary as the herbs were in complex combinations, and high doses. It’s important that we know and understand how far we can safely go by ourselves, and when to involve a vet trained in the use of herbs. Iris was amazing, as ever, but we had another star of the show – Ralphy Ralph Dog and his new “dad”! Ralph did very well to sit through the talk, and resisting greeting everyone with enthusiasm ALL the time. This was a big challenge for our boy!! I fostered Ralph earlier this year, and have been supporting his new humans in settling and developing him. This little dog had a rotten start in life, and is now flourishing in a safe forever home with a super pair of humans to call his very own!! As a real bonus for us, his “mum” (who unfortunately wasn’t able to be with us) made some amazing cakes, which were sold to raise funds for the Bedlington Terrier Rescue. Together with Iris’s donation of the proceeds of her talk, we raised over £150 for the rescue, so thank you to everyone who came for their generosity! I became involved with the Bedlington Terrier Rescue last year, when I was asked to carry out a home check for another dog, then I got involved with Ralph as there was a possible home near to me. That didn’t work out, so he came to me whilst another solution was found. I am SO very impressed with the efforts this organisation goes to to place dogs and support the humans in the new home. We will be looking at lots of ideas to support the rescue via our events next year – this may involve cake!! We hope to have Iris to talk to us again next year, do let me know if you would be interested, and watch the events page for more information!